What’s the best way to make money in the smartphone apps market? Surprisingly, the answer is to give away apps for free—and to generate revenue on subsequent sales of in-app purchases. 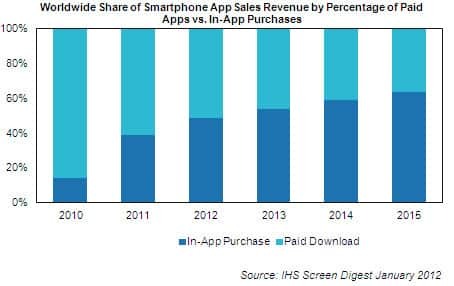 In-app purchases will rise to account for 64 percent of total market revenue in 2015, up from 39 percent in 2011, as shown in the figure below. Revenue from in-app purchases will increase to $5.6 billion in 2015, up from $970 million in 2011, according to the IHS Screen Digest Mobile Media Intelligence Service at information and analysis provider IHS (NYSE: IHS). The business model of offering apps for free, then charging for in-app content, is known as “freemium.” This app strategy represents the fastest-growing segment of the global smartphone apps business, and will soon dominate the market. By the end of the third quarter of 2011, free-to-download applications already represented 45 percent of the top-grossing U.S. iPhone applications as well as 31 percent of the highest-earning U.S. Android Market applications. IHS Screen Digest calculates that 68 percent of the top-grossing U.S. applications featured some form of additional content or functionality available via an in-app purchase. Most in-app purchases at the end of the third quarter of 2011 in the U.S. and U.K. involved buys of virtual currencies, such as additional chips for poker, or redeemable points in games. Virtual currencies so far have been almost exclusively employed in games, with other types of apps using in-app purchases for more specific item buys. IHS Screen Digest estimates 63 percent of in-app purchases on the U.S. iPhone App Store at the end of the third quarter were for virtual currency. The next most popular category of in-app purchase was for specific in-game functions or features, rather than general currency, which accounted for 22 percent of the most popular U.S. in-app purchases. Other popular in-app purchases include time-limited navigation services, dating and premium social network access, as well as specific functions or features for photo and video apps. Payments for additional media content via in-app purchase did not make much of an impact on the top-performing apps in the third quarter of 2011, with just 2 percent of the top U.S. in-app purchases offering additional television or video content, and none doing so in the United Kingdom. Time-limited subscriptions or in-app purchases to newspaper/magazine content did make an impact, however, in the United Kingdom—accounting for 5 percent of the top iPhone in-app purchases during the third quarter.